Tall Tuesday: How's the Weather Up There? I can't tell you how many time's I've heard this question in my lifetime. It's a question learned in elementary school and continues through adulthood. It may be a subconscious humorous icebreaker for the shorter person as if asking, "Aren't you a pretty boy?" to a snarling pitbull. I'm not offended by the question. It's just that it's so inane I don't even feel like responding to it most of the time. However if you do get asked this question, here are a couple of possible replies. If you are male and feel attracted to the person asking you, you might say with a wink and a smile, "Well I have a flagpole about half way up if you'd like to climb up and take a look!" or for the tall woman, "I have an observation deck about three quarters up if you'd care to see for yourself!" If you're in a particularly beligerant mood (and feel you could take the other person in a fair fight), you're retort might be, "Cloudy - WITH A CHANCE OF RAINING FISTS UPON YOUR HEAD!!!" But most of the time just answer, "FANTASTIC!" The buildings and raining fist illustrations were drawn on linen cardstock using india ink and brush and a black litho crayon with a non-repro blue pencil underlay. They were then scanned and colored in Photoshop using the dissolve setting of the paintbrush and airbrush tools. I created the top illustration using only ArtRage3 Studio Pro to see how closely I could replicate the others. I used multiple layers; the first for the rough pencil sketch. The drawing was done using a black, dry marker on a basic paper layer. The linen texture was created using a black chalk tool on a cross hatched texture layer. Separate layers were made for the blue and white colors on basic paper settings using a mix of the oil brush and marker. It was faster to make, but I still find working with real tools, where I can feel and hear the brush and pencil dragging across the course paper to be a much more sensual and satisfying experience. And I have something concrete when I finish. This is the first of my new “Tall Tuesday” posts that deal with life as a taller than average person. 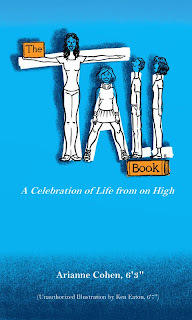 I was inspired by one of the new books in my local library, “The Tall Book, A Celebration of Life from on High,” by Arianne Cohen, 6’3”. Being 6’7” myself I thought, “I have got to read this!” It gave me a whole new perspective on my height. A word of warning for those below 6 feet tall, you will either find the book interesting or read the first few pages, get irked and insult the next tall person you run into. The book unabashedly promotes the benefits of being tall from societal views, health, money and power, especially in the first chapter. From chapter two on you dive into what it’s like growing up tall, fitting into public transportation, chairs and toilets made for the average height person, tall dating and relationships and being a very public entity due your stature. Miss Cohen gathered a wealth of information from people around the world on the subject of human tallness and shares several stories from her own life. Besides there being many stories where I thought, “That was me! That happened to me!” her book caused me to reflect on my own life and wondered if some things worked out a certain way because I was tall or because of my character. It also caused my to take another look around the corner offices at work think about the relative height of the upper management. The tall trend seems to measure up. I saw plenty of fun illustration opportunities within the book in addition to the ones already there. As already mentioned at the start it also sparked the idea of an illustrated Tall Tuesday for my blog. I thought my first post would be my take on a cover for the book. After several doodles I came up with the one shown. I thought there needed to be a human element and made a light caricature of the author herself standing head and shoulders above others. I stuck with the blue, orange, white and black color scheme of the original cover. The figures were inked with a brush then scanned and cleaned up in Photoshop. This was imported into the newly released ArtRage3 where the color and text were added. I wanted "Tall" to grab the reader first with the figures coming in secondary. There is a phrase, "shoot the engineer," in the automotive industry because left on their own, engineers will typically take forever to release a design because there is always something to improve. I could have used a good art director to "shoot the illustrator" because I kept noodling over this cover. I would be interested to hear what others have to say. And check out Miss Cohen’s website ! It has tons of fun and informative stories and promotes tall activism. More airplane legroom! More tall clothes! You get the picture.